I have been procrastinating on completing two embroidered bags for my great nieces. They are such adorable girly girls and love all things sparkly. I did a simple script initial and name design on both of the bags. Then, I pulled out the old "gem-master" from out of the cabinet and used it for the first time. OK, now I want to bling everything. It was soo simple! I'm sure the little ones will like their new overnight bags, or toy bags. They are simple denim bags that were pre-purchased. 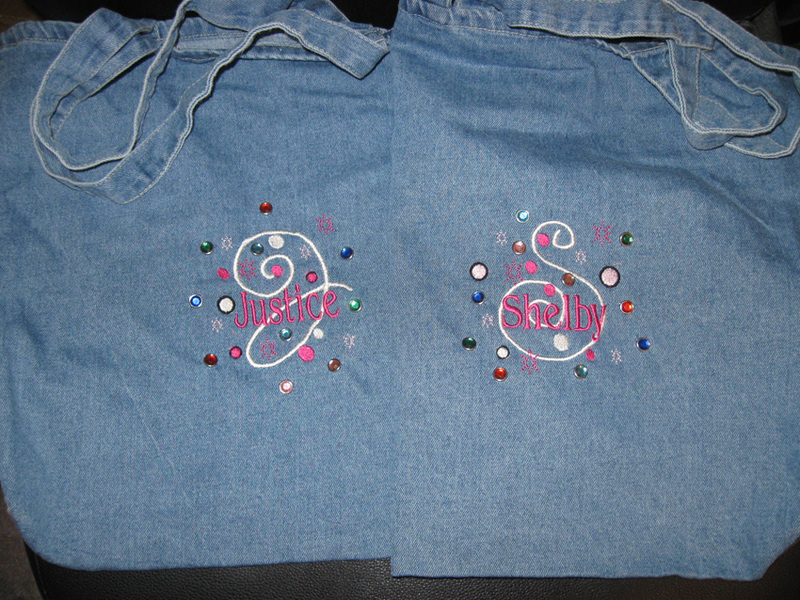 I used to take the kids old geans, make them into bags and add the blings to them too! I love the embroidery! Wish I'd thought of embroidery and quilting machine when I bought my Janome. ps. am still working on finishing my grandmother quilt which I shall ask for the final instructions for your work! thanks again, you have no idea what this will do for my aunt.